Hello Ruby Rock-It and Elizabeth Craft Designs Fans! We are very excited to be partnering together this month, and to bring you this fun blog hop! Each of our companies is offering a beautiful prize! Here's all the fun details on how you will be eligible to win! Start at the beginning of our hop right here! And then simply follow the order listed below, making sure you stop and leave some love in the comments section for each designer! Please make sure to include your email in the comments section, so we will be able to contact you should you win! "Like" Ruby Rock-It and Elizabeth Craft Designs on Facebook, and leave a comment, letting us know you came from our blog hop. Comments will close Friday, October 10th at 11:59pm PST, and we will announce our winners the following week! Be sure to come back next week to see if you have won! Ruby Rock-It is offering our beautiful Essence Empire Bebe collection to one lucky winner! 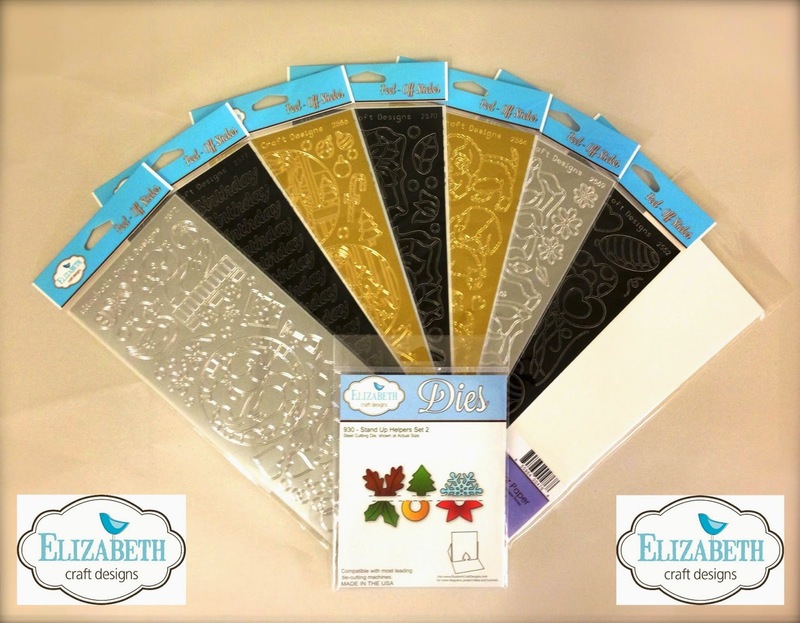 And the Elizabeth Craft Designs prize is a package full of fun Peel-Offs from their new collection, Stand Up Helpers Set 2 and a pack of Watercolor paper. If you're here from Mary Prasad, then you’re in the right place, if not then you may want to start at the beginning right here! . Hi my name is Jackie Smith and the project I like to share with you today is this quick Happy Birthday card using Elizabeth Craft Design Peel-Offs and Ruby Rock-it Papers. 2. Cut Blue glitter flower paper 4 3/4"x 6 3/4" and Rain drop paper 4 1/2" x 5". 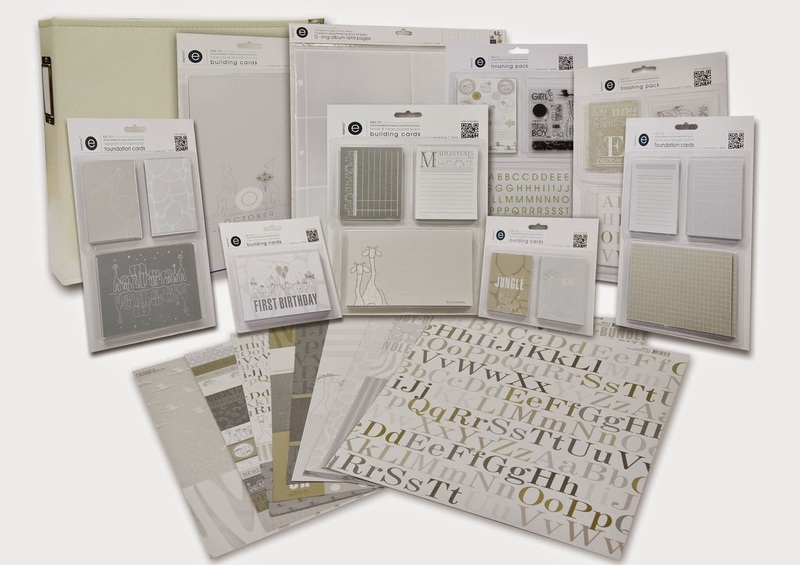 Adhere using Double-sided Adhesive sheets. 3. Cut dark green paper using the Tree edger from the Outdoor Edgers (914) and cut the light green paper using the plain edger from the same die. Adhere using pop up dots. 4. Cut out "Happy Birthday" using blue/red heart paper. Apply as shown. 5. Place black Rubber Ducky & Umbrella Peel-offs onto white cardstock with double sided adhesive on top. Cover Peel-offs with Cool Diamond Silk Microfine Glitter and polish glitter with your finger. Use a brush to brush of the excess glitter. Follow Els’ step by step instructions for this technique here. 6. Color Rubber Ducky and Umbrella as desired. I used Tombow Dual Brush Markers although they do require extra time to dry as they are water-based. Use alcohol-based markers instead of water-based markers if you prefer. Adhere Rubber Ducky and Umbrella using pop up dots. 7. Adhere self-adhesive Droplets using pop up dots as shown. Here is a bonus card using some more papers. 1. 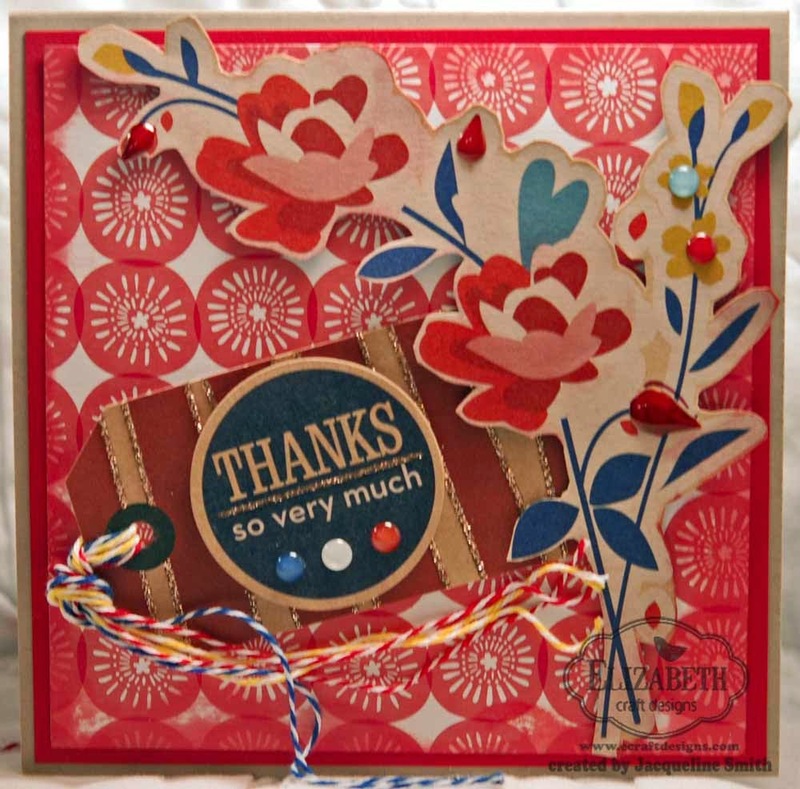 Create card base using red cardstock. Cut 51/2"x 5 1/2" square paper; score & fold in half. 2. Place Lots of Pops PopUp; making sure the nibs line up on the fold line. Cut another rectangle 6″x 12″ for the backing card. 51/4"x 5 1/4". Place Lots of Pops PopUp on the edge of paper and die cut PopUp insert. You will need your scissors to cut out the Lots of Pop insert completely. Do this on both papers. Karen explains this step in her video as well. 4. 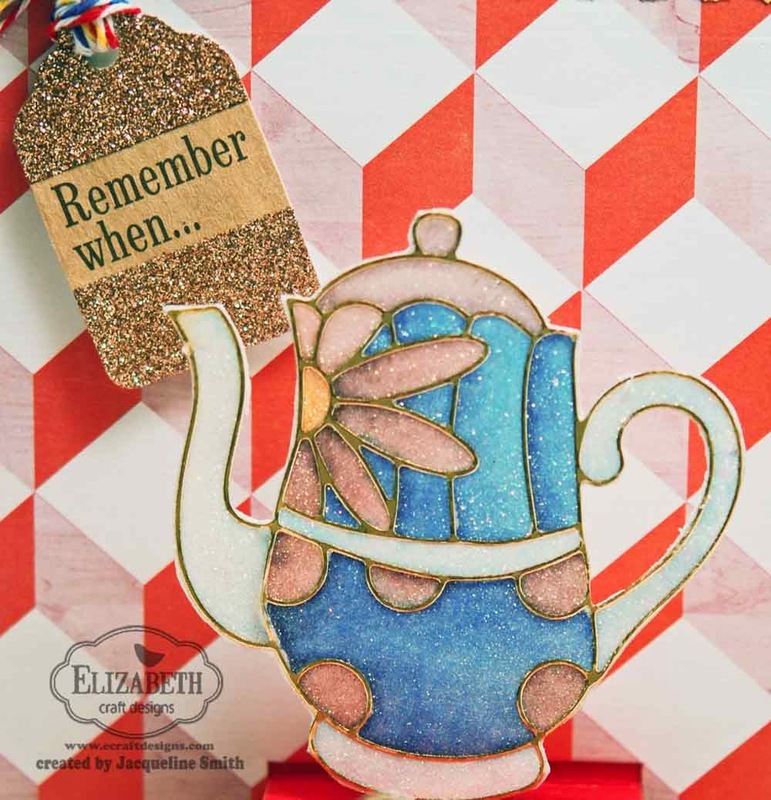 Place gold Tea pot, teacup, creamer and sugar bowl Peel-offs onto white cardstock with double sided adhesive on top. Cover Peel-offs with Cool Diamond Silk Microfine Glitter and polish glitter with your finger. Use a brush to brush of the excess glitter. Follow Els’ step by step instructions for this technique here. 6. Color Tea pot, teacup, creamer and sugar bowl as desired. I used Tombow Dual Brush Markers although they do require extra time to dry as they are water-based. Use alcohol-based markers instead of water-based markers if you prefer. Adhere them using glue dots. 7. Add blue, red and yellow twine to the sticker in the left hand corner as well as to the tag. Cut out "Congratulations" using the Congratulations Standup Helper die using blue paper. Adhere under the tag. Apply flower sticker as shown. 8. For the front of the card, cut red paper 5 3/4″x 5 3/4″ and red circle paper 5 1/2″x 5 1/2″. Layer and adhere using double sided adhesive. 9. Cut flowers out using Floriade paper leaving a halo. Adhere using pop up dots. Add tag along with 3 colours of twine. Add sticker using pop up dots. Adhere self-adhesive Droplets as shown. Add red Glitter Holly Borders as shown. Thanks for joining me and please hop over to Kaka Costa blog to see what she has in store for you. Don't forget to leave a comment on each of the designers projects. I love the use of the glitter for the design. So pretty when it is sparkly and the bonus cards are so pretty. ver neat-thanks for sharing them. Holy Apple Pie in the Sky! Where to begin?!?! The Ducky card is adorable! My granddaughter would love this sweet card!! Your bonus card makes my heart sing! LOVE the sparkly accents!! I am a glitter addict and this card is truly sparkaliscious! Makes my heart sparkle seeing it!! TFS! Forgot to leave my email! It is: macaskillbarbara@yahoo.com just in case I am a lucky winner!! 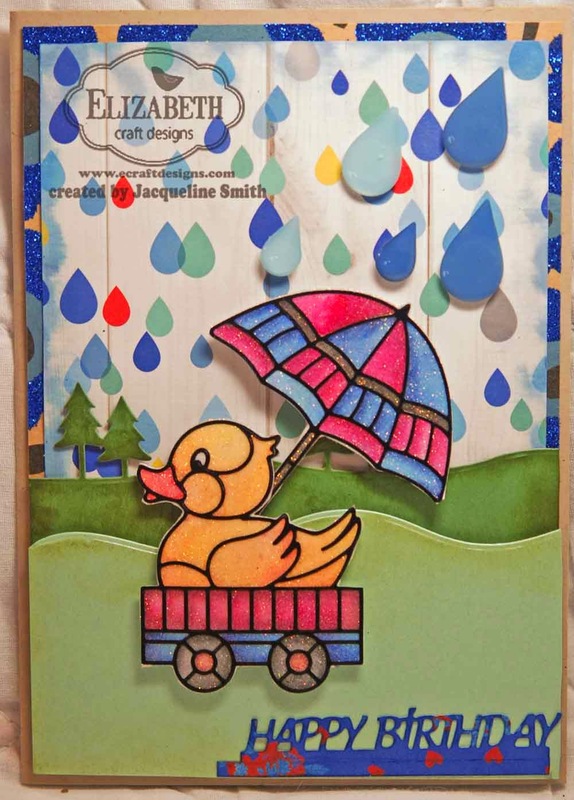 Love the ducky raindrops and umbrella and the tea card is just great for tea time! So cute and I am officially as in love with the rain drops as I am with the glitter owls. Thank you for sharing. It is great seeing so much inspiration. Fun and cute cards Jacque! The rain is perfect for the ducky! Very nice! Thanks for sharing your ideas. Love the rubber ducky card. It looks so 3D, popping out at you. And all those raindrops too. LOVE both cards! The second card is fabulous! I love your use of bling to make the card soooo pretty. Thanks for your great ideas. Such beautiful cards! Love the color combinations and the overall look. 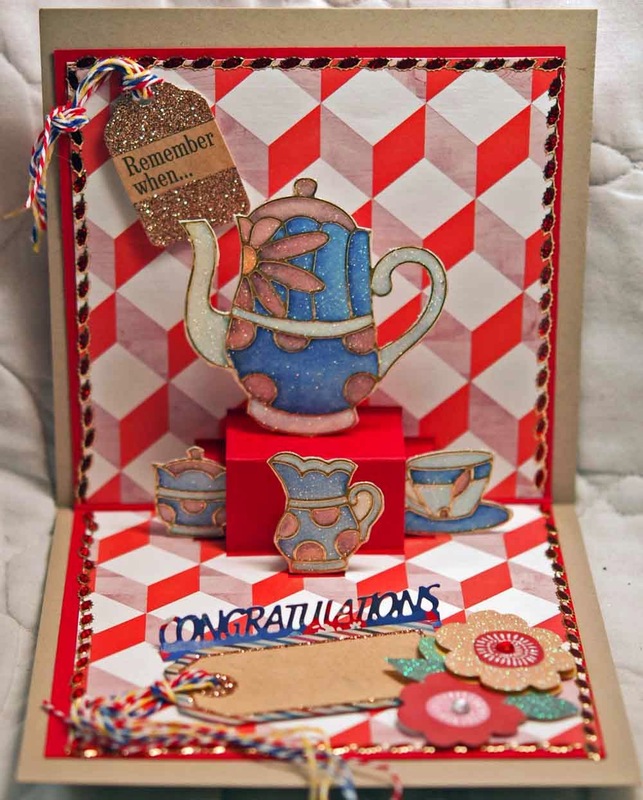 Your bonus card is a real treat, LOVE it inside & out with the pretty papers and sweet tea party!!! 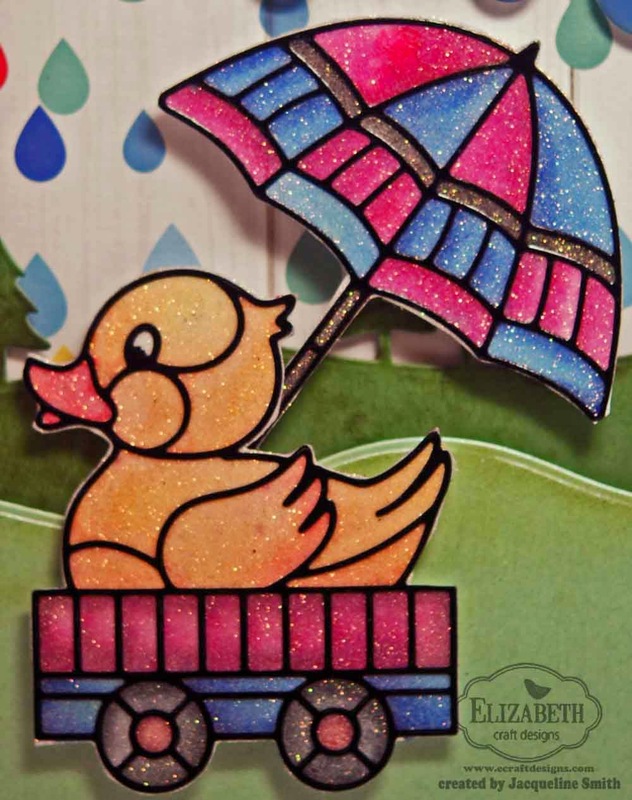 As for your birthday card, it is SERIOUSLY AWESOME & SUPER CUTE too - LOVE your SPARKLY rubber ducky, pretty raindrops, rolling hills and dimension too!!! Stunning cards! I love the vibrant colors and pretty embellishments. Thanks for sharing. I Sea it's your Birthday!